INSCT Faculty Member and Professor of Law David M. Crane was a keynote speaker at a conference on human rights and the embargo of Qatar at a side event at the UN General Assembly meeting in New York City on Sept. 21, 2017. 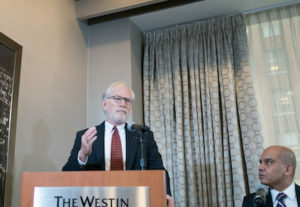 Also speaking at “The Human Rights Dimension of the Unprecedented Blockade Against the State of Qatar” was Professor Ken Harper of the Newhouse School. “I was asked to speak on the critical role a free press plays in a civil society and the great sacrifices journalists make to bring us the stories of our shared humanity,” says Harper. A diplomatic row over alleged funding of terrorism has led several neighboring countries to cut ties with Qatar, including Saudi Arabia and Egypt, and critics says the resulting Qatar blockade is adversely affecting the civilian population of the Persian Gulf state.